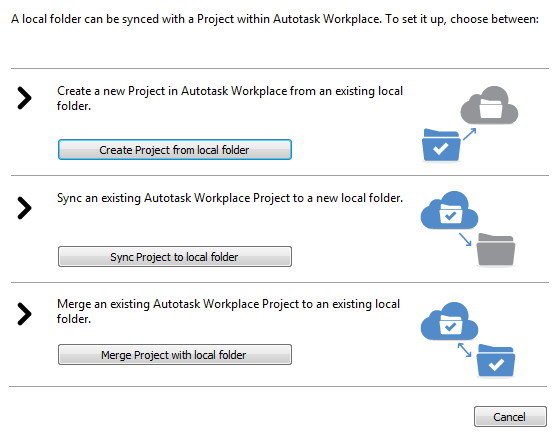 Local folder syncing allows any folder accessible to your Workplace"Workplace" describes the Autotask Workplace service in its entirety. server to be synced with the Workplace service, enabling you to sync projects to the locations most convenient for you. With local folder syncing, you don't have to rearrange or move your data in order to sync it to the Workplace service. These folders can be located anywhere on your local drive, an external drive, or a network drive. These synced local folders provide the majority of the same features and functionality as a project. In fact, a local folder that is synced becomes a project within the Workplace OnlineWorkplace Online is the web portal that users within a team can use to access their data and administer their team. via the Workplace ServerWorkplace Server is a component of the Autotask Workplace service. It makes all your files accessible through Workplace while retaining local, centralized data storage so that your data is also available via your local area network (LAN). The Workplace service keeps all data on your LAN accessible internally and in sync with Workplace. device. 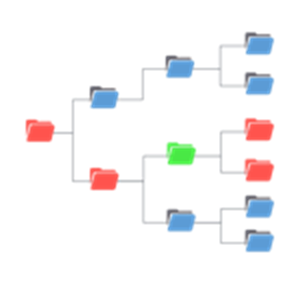 The Folder Sync tab allows you to sync a project to a local location, to create a new project syncing with an existing local folder, and to merge a local folder with a project. The merge option is particularly useful if the local folder becomes disconnected from the project. Merging the two will allow them to be quickly reconnected. For instance, if you need to replace a machine that is hosting a Workplace Server instance syncing to a network volume, this merge option can be used to get Workplace Server on the replacement machine back into full operation very quickly. When adding folders to sync, we recommend that you always use the UNC (Uniform Naming Convention) path or navigate using the Network section in the Explorer sidebar. Mapped drives, on the other hand, are associated with a user account and will disconnect as soon as the user logs out. it resides within the folder structure of a local folder that is already syncing with a project. Only one instance of Workplace Server or Workplace DesktopAlso known as the Workplace Desktop app, and in the context of this documentation, simply "the app," Workplace Desktop is the software installed on a computer that is responsible for synchronizing data between the local drive and the cloud. can create a Workplace project from the same folder on any network drive. If another team member subsequently attempts to convert the same folder to a project, they will receive a warning that the folder is already being synced by an instance of Workplace Desktop or Workplace Server. They will then have the option to take over ownership of that folder or cancel the operation. If a local folder that is synced to a project is moved, renamed, deleted, or unavailable (in the case of network or external drives), Workplace Server will alert you to the issue with a popup notification from your taskbar and within Workplace Online. In addition, an email alert will be sent to the recipients you've specified. To correct sync violations, please use the Server Detail: Sync Errors tab on the Server Detail page in Workplace Online or on the Workplace server. Sync errors must be corrected on the server. In order to ensure successful folder sync, please review File Types That Should Not Be Synced to Workplace. You must be very careful to not use a folder structure that contains file types that should not be synced, e.g. the OS-created Documents folder within a Windows user profile on the Workplace Server machine. 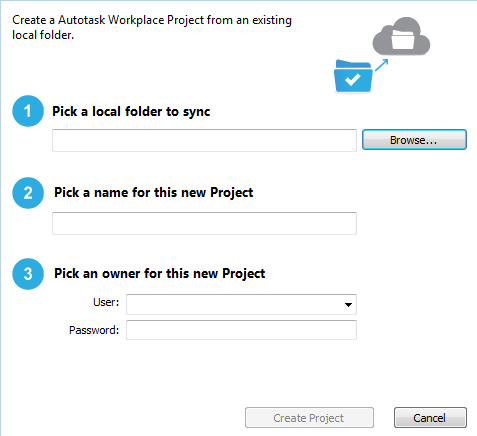 Create a Project from Local Folder - Select this option to create a new project in the Workplace service from an existing local folder. 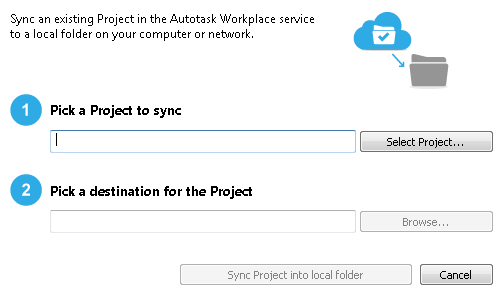 Sync Project to Local Folder - Select this option to sync a project from the Workplace service to a local folder of your choosing. Merge a Project to a Local Folder - Select this option to merge a project with a locally stored copy. This is particularly useful in rare instances where a project must be reconnected with a locally stored copy, such as after a reinstallation of Workplace Server. If you use the Browse... button, be sure to navigate to "Network" and select the network drive. Do not select a mapped network drive. Select an owner for the project that will be created in the Workplace service. Enter the primary account password of the owner you have selected. ONLY primary accounts are supported. Only projects that are not already synced locally will be displayed as available to sync. If you wish to sync a project that is already on the Workplace Server machine to a different location, the project must first be unsynced. Any local files that do not exist in the Workplace service project will be removed. 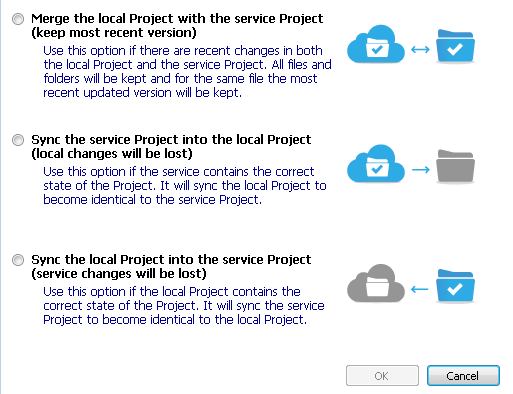 Any files in the Workplace service that do not exist in the local project will be removed. Workplace Server will scan all the files in the local folder, compare them to those on the server, and connect all files that match precisely.